thinkst Thoughts...: Nothing (really) new under the Sun - Verizon Breach Report.. Nothing (really) new under the Sun - Verizon Breach Report..
Once more, the report makes for interesting reading and this year the discussion point is bound to be the marked decline noted in compromised records (From 361 million in 2008, to 144 million in 2009, to 4 million in 2010). 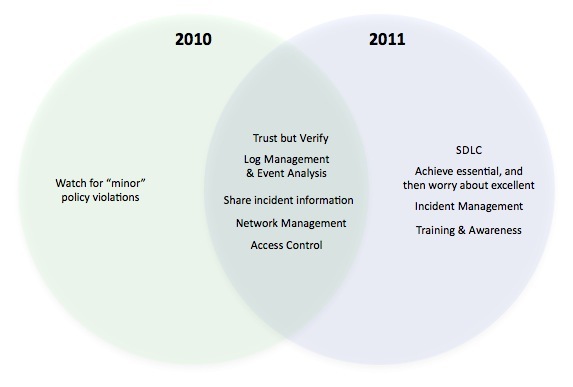 We will kick off a ThinkstScapes adhoc update to customers analyzing the report, but thought one of the interesting points to note was the similarity between 2010 and 2011 recommendations. A quick point for point comparison shows that the 2011 recommendations are an almost perfect superset of the 2010 recommendations. The prognosis then? more of the same + a little bit more? The report itself is pretty open on this: "The latest round of evidence leads us to the same conclusion as before: your security woes are not caused by the lack of something new (Figure 43 looks about like it always does). They almost surely have more to do with not using, under using, or misusing something old." "To that end, we’ve found some old recipes for achieving newfound success. We examined top attacks from 2010 and identified recommendations from our previous reports most applicable to them"